The name of iPad mini to be "iPad mini"
According to Asian source, the name of Apple's new product, which are expected to have 7"85' and called as iPad mini, will be named as "iPad mini" officially. This source expects that "iPad" logo will be printed on back of case same as "iPod" is printed on iPod nano and iPod touch, and it means one new product will be added on iPad's product brand genre. 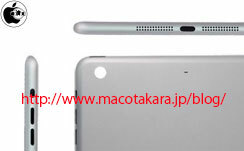 I mention one interesting rumor, which tells "new iPad" will be replaced with micro-dock equipped one, and a Japanese mobile operator (which operates iPhone 4S but not iPad) will add this new iPad on their line-up. And I point my past report about next iPod nano and iPod touch, these should be mentioned also. Next iPod nano may equip Wi-Fi antenna on side of that case, and support iTunes Music Cloud in order Apple to provide a iconic product to promote the largest Music Store in the world. Last my attention is a misterious hole beside iSight camera of iPod touch. This hole is similar with Wi-Fi antenna of iPod touch (3rd generation), and is pit beside iSight camera of next iPhone and is covered by front glass. If this hole is for NFC, next iPod touch may support it also. And a misterious is left, a hole on back case of iPod touch does not give me any idea.